Tonight I got around to inspecting the spars. These things are really nice. I noticed that one of the spars had some smudge marks in it - about 9 of them. Under closer inspection, they looked like they were polished out scratches, but I wanted a second opinion. I called up Van's and spoke with Ken in builder support. He said that they were just scratches that were poliched out with a scotchbrite pad. He said the only way he would get excited about spar damage was if there was a bandsaw cut more than 1/2 way through the spar! The spars layed out for inspection. This is the largest smudge mark. 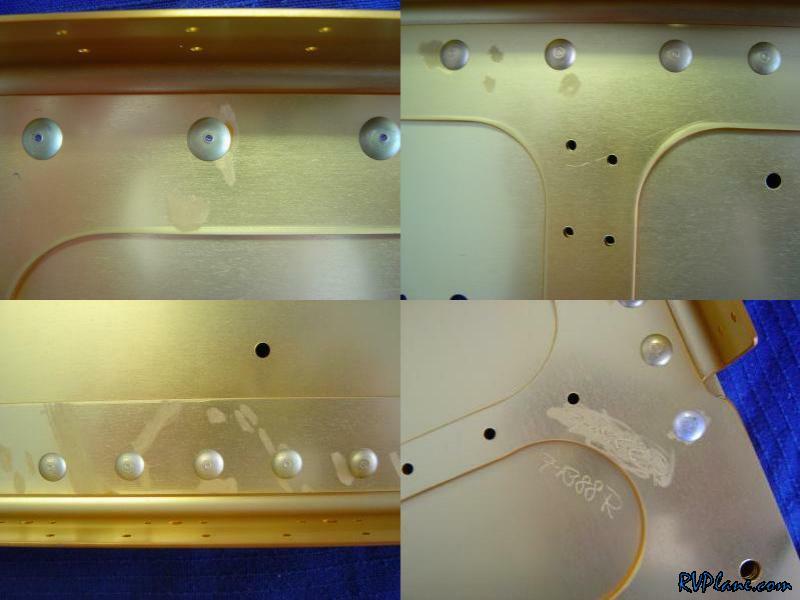 You can see polishing marks in it and also the gold anodization. I would of been more worried about this if it was bare aluminum. Here are 3 more smaller ones. This is the tip of the spar. It is hard to see, but in shipment, it looked like some of the anodization was rubbed off. I circled it with a sharpie to remind myself to dab a little primer on it. This is a pic that James Painter posted on the VAF forums of his spars. It makes me feel better to see someone elses.